We interviewed Ally Brown, a Senior Employer Branding Specialist at Continental. We asked her about the biggest talent acquisition challenges at Continental. Ally also presented the most successful Employer Branding tactics and campaigns used at Continental. It is our great pleasure to present an exclusive interview with Ally Brown, a Senior Employer Branding Specialist at Continental. Continental is the technology company which develops pioneering technologies and services for sustainable and connected mobility of people and their goods. In 2017, Continental generated sales of €44 billion and currently employs more than 244,000 people in 61 countries. In this interview, we asked Ally to share Continental's employer branding best practices and challenges. ➡️ Employer Branding will be one of the top recruitment trends in 2019. Check out the rest of Recruiting Trends You Should Implement in 2019! 1. Ally, can you tell us a little bit about yourself, your background and job at Continental? I recently joined Continental to lead employer branding for the U.S. and Canada. In my previous marketing roles, I’ve had my hands in everything – writing, social media, graphic design, web development, partnerships and events – all skills that have proven valuable in my role today. As a Fine Art undergrad, I love being able to use my creativity and have grown to love the business side of marketing – even spreadsheets. In my free time (which I don’t have much of anymore thanks to my 1-year-old twins) I like to run, travel, and try new restaurants. 2. What are some biggest challenges that Continental is facing in Talent Acquisition? What type of talent is hardest to find and attract? The number one challenge we face in this market is brand perception. The automotive industry is going through a huge transformation and the skills required to compete are changing Continental has a legacy as a tire manufacturer, but we’re so much more than that. Once people realize our vision and the technology we’re working on like autonomous vehicles, smart cities and vehicle connectivity – that’s when we see candidates get really excited. ➡️ Learn more about the Talent Acquisition! 3. Do you think Employer Branding today is more important than 5 years ago? If so, why and how? Yes, considering I hadn’t heard of employer branding five years ago! I think there are multiple reasons that it’s becoming increasingly important besides the obvious challenges presented by the low U.S. unemployment rate. The generational shift and our access to information is creating more competition for employers and causing people to change jobs more frequently. The Amazon effect isn’t just disrupting retail. It’s changing the way people search for jobs. Candidates are going to research multiple companies before making a decision. They will look at different sources, read reviews, watch videos and rate their candidate experience. ➡️ Check out the List of HR Statistics That Have Changed The Way We Recruit! 4. Many people say that recruiters need to think like marketers, is this true and what do people mean by that? I think recruiters need to think like salespeople. The company is the product and they need to sell it to the candidate. If they don’t have an employer branding team to provide them with the right tools, then they probably need to wear both hats, which I think is really difficult to do successfully. If you want to learn how to think like a marketer, check out the Recruitment Marketing 101 guide! 5. How do your marketing skills help you do Employer Branding? Employer Branding is marketing. The only difference is the audience. Instead of products, you’re selling the company, so you need to really know the future vision, mission and values and be able to effectively communicate that. ➡️ Learn about the Difference Between Recruitment Marketing and Employer Branding! 6. Are disciplines such as Employer Branding and Recruitment Marketing something that should be owned by HR or Marketing? Good question – it could be either or both, as Employer Branding is highly cross-functional in nature. You need to know the brand strategy and the HR strategy. As a matrix organization, our team is set up under HR, but we also report indirectly into Communications and are in close alignment with the team. 7. What are some of the most successful Employer Branding tactics or campaigns that you do at Continental? We’re still in the brand build phase so I’d say our biggest success to date has been getting stakeholder buy-in and keeping key partners informed of our progress. Also, increasing our digital presence has already shown a 200% YOY increase. We launched a new Facebook channel, started posting more consistently on LinkedIn, and invested in premium profiles on Indeed, Glassdoor and Fairygodboss. ➡️ For more employer branding ideas and tactics from big brands, check out How Do Facebook and HubSpot Attract Talent. 8. Do you include your own employees in recruiting and Employer Branding? Do you have ambassadors? We don’t have official ambassadors yet but are working on a program to launch in 2019. I think the most important things when building an ambassador program are to show “what’s in it for them,” make it extremely easy and fun to participate. As a proud partner of Social Recruiting Strategies Conference (SRSC), we are inviting you to join us and learn the best practices in recruiting form today’s most successful Talent Acquisition pros. Social Recruiting Strategies Conference will take place on in San Francisco, January 30 - February 1, 2019. 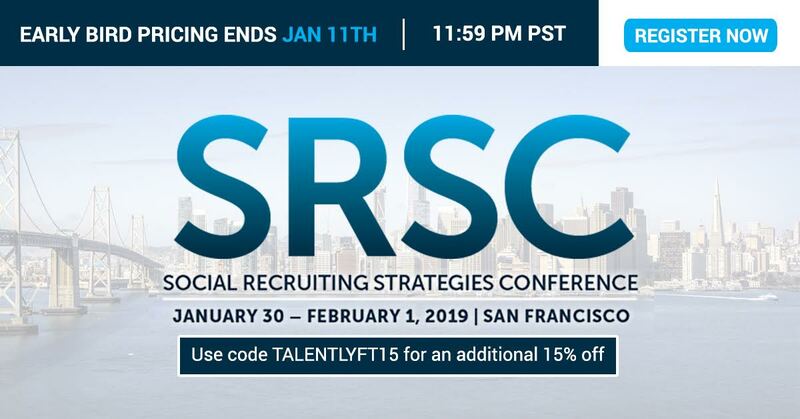 SRSC is the conference leader for recruiters and talent acquisition professionals across all industries - offering the latest in global recruiting trends, data analytics, recruitment marketing, candidate experience, tools and technology. Attending this conference will also give you the chance to meet and network with a diverse group of recruiters, HR, TA, and employer brand professionals across industries. ➡️ Get your ticket here!